Assisted by the pastor of the parish community Rev. Fr. Theophan Mackey and Very Rev. Fr. 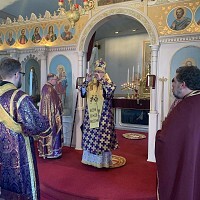 Gabriel Rochelle of St. Anthony of the Desert parish in Las Cruses, NM as well as Deacon Michael Abrahamson of Holy Archangel Michel Ukrainian Orthodox parish in Woonsocket, RI and Deacon Clint Kifolo of St. Anthony of the Desert parish in Las Cruses, NM – Archbishop Daniel carried inside the sacred temple the relics of Venerable Job of Pochaiv, who is a patron saint of the parish family. 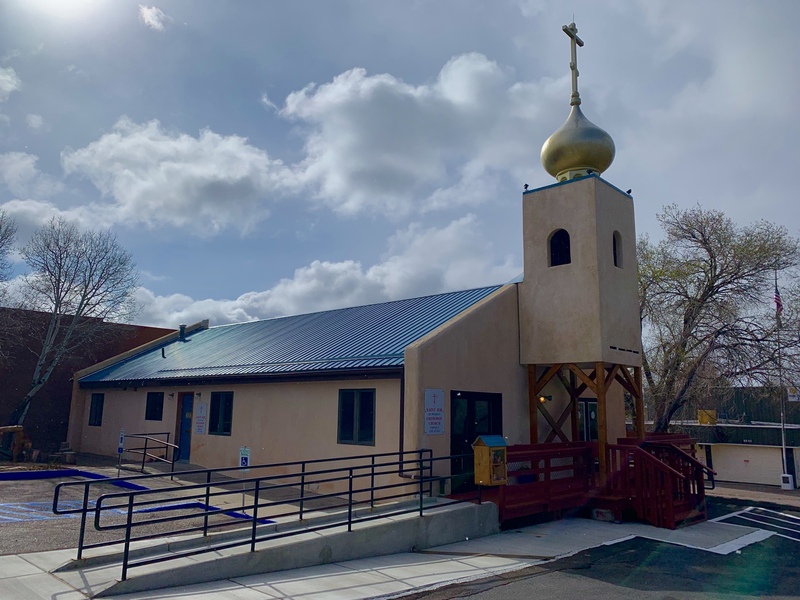 Flying from the Spiritual Center of the UOC of the USA in NJ, Vladyka Daniel arrived to Albuquerque, NM with the seminarian of St. Sophia Ukrainian Orthodox Theological Seminary Subdeacon Yurii Bobko, who assisted the hierarch with the logistical liturgical responsibilities. 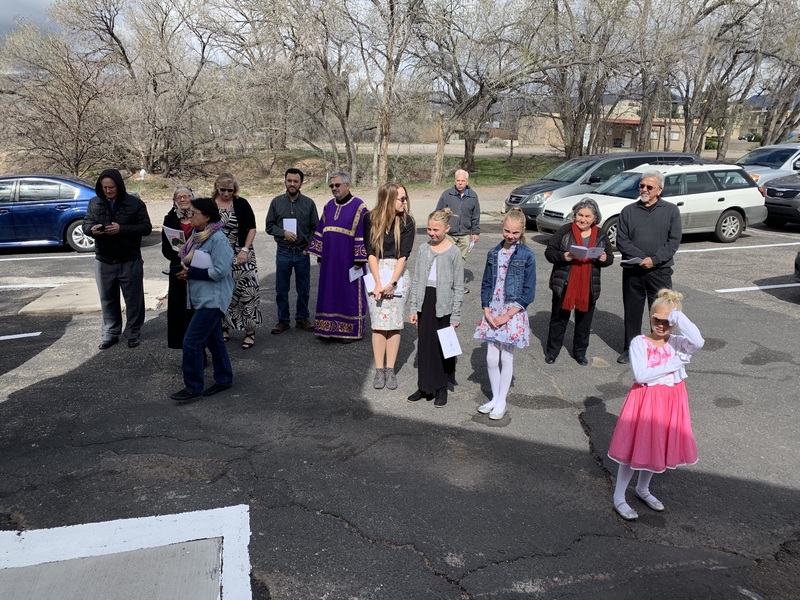 Following the arrival to Los Alamos, NM Archbishop Daniel presided over the celebration of the Vespers service, which was prayerfully served by Fr. Theophan and the chanters of the parish’s choir. 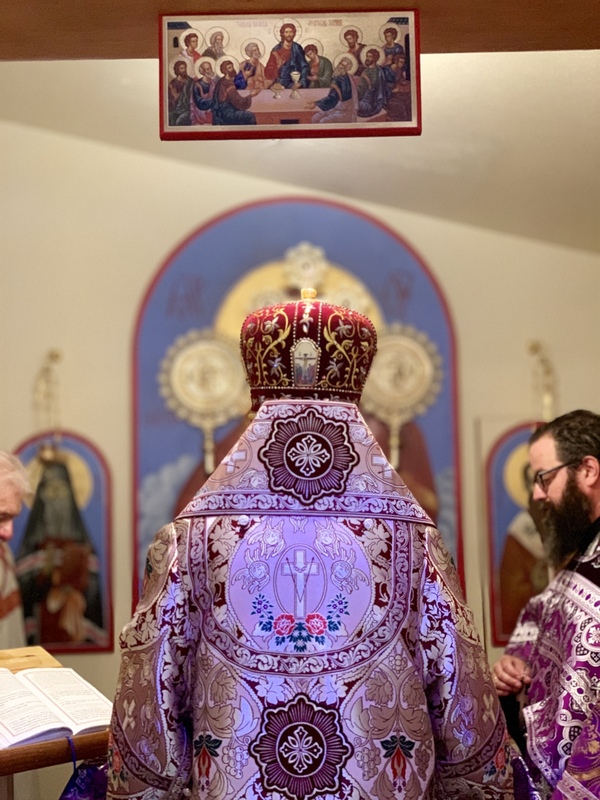 Welcoming the hierarch, Fr. 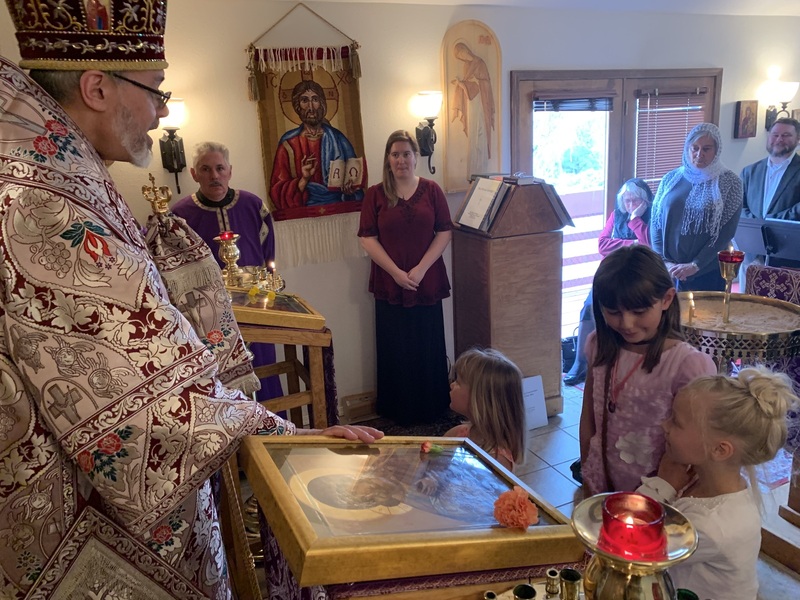 Theophan emotionally spoke about the long-awaited moment when the sacred relics would be installed in the altar of the parish. 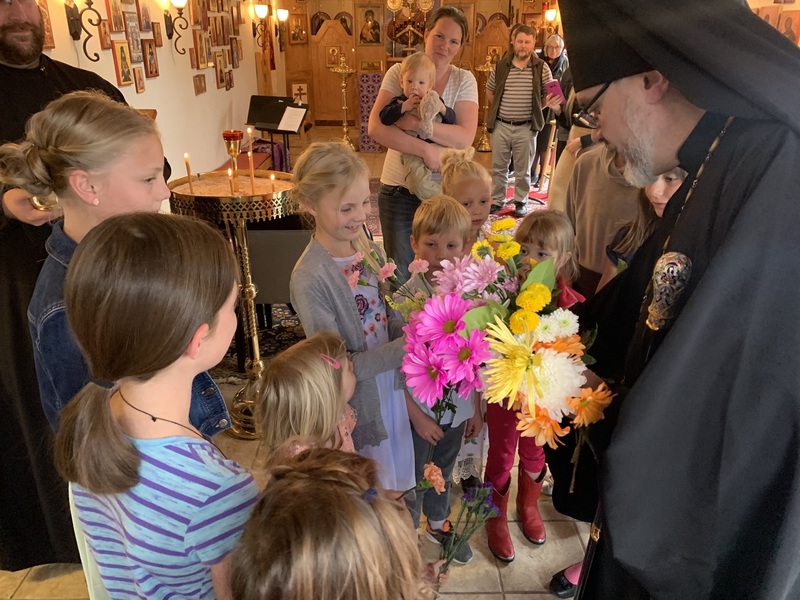 Responding to the words of welcome, His Eminence Archbishop Daniel reflected about the notion of the time of spiritual and patient expectation moment, which early on Akathist Saturday morning led to the consecration of the “very heart” of the church community. 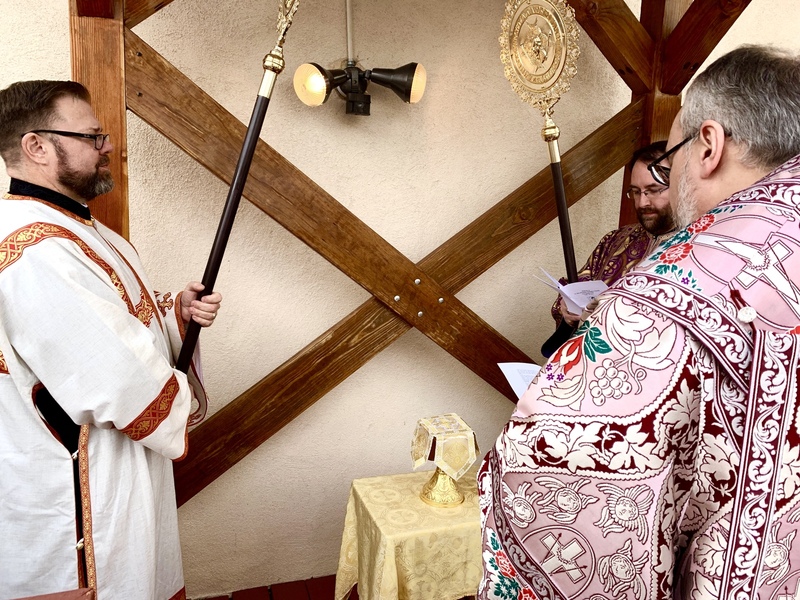 The Saturday morning liturgical service began with the prayerful procession with the relic of St. Job of Pochaiv being installed in the sacred altar of the parish. 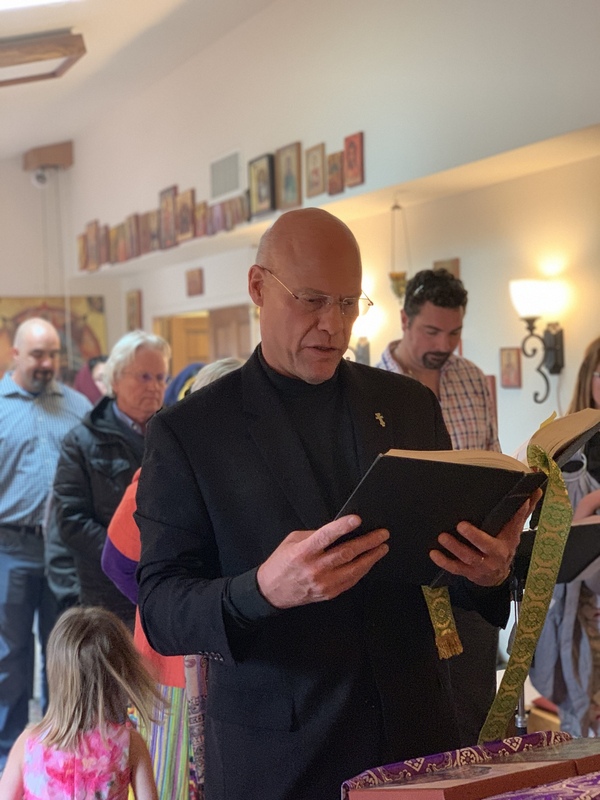 The archbishop standing in front of the Doors of the church, started a short prayerful dialogue. The words of this conversation were taken from Psalm 24. This act represented Christ the King entering and taking over the Church building by defeating the power of the devil. 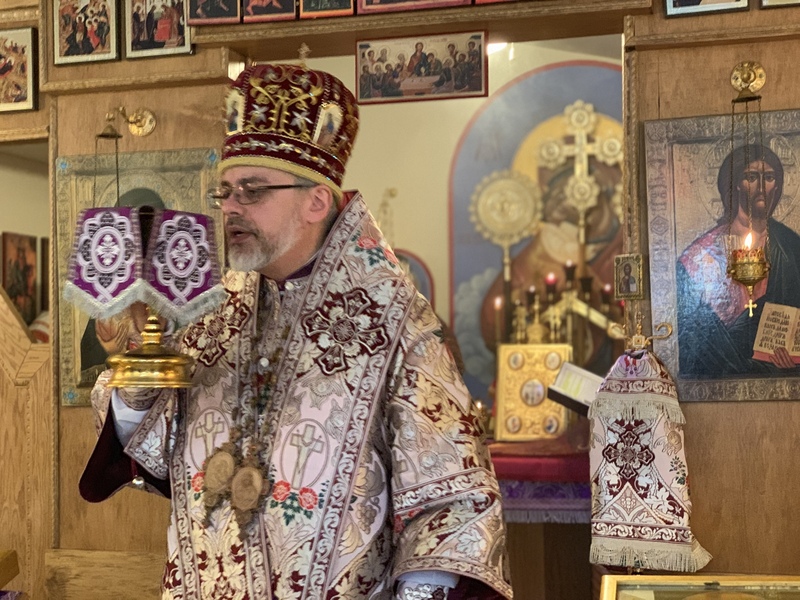 Vladyka Daniel raised the Paten with the relics and made the sign of the Cross before the Church doors. 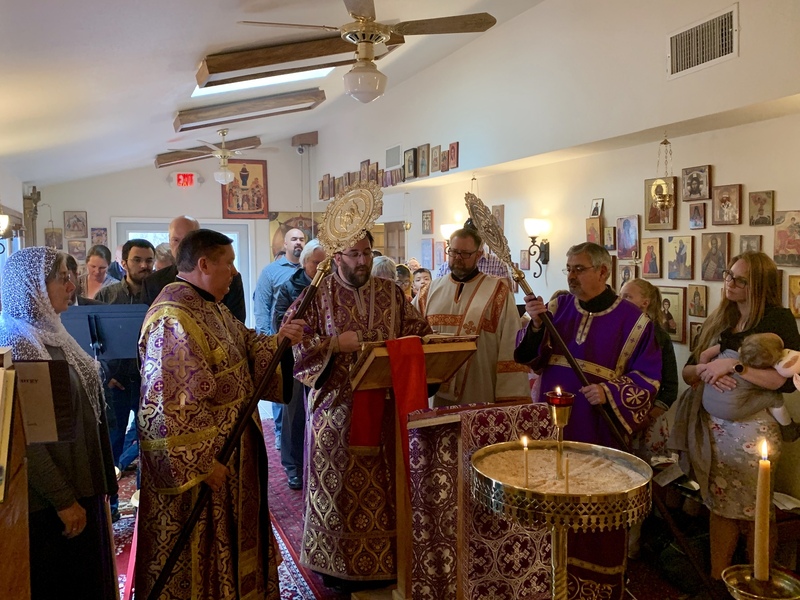 The doors to the church were unlocked and the archpastor entered the Church carrying the Holy Relics followed by all the clergy and the congregation. 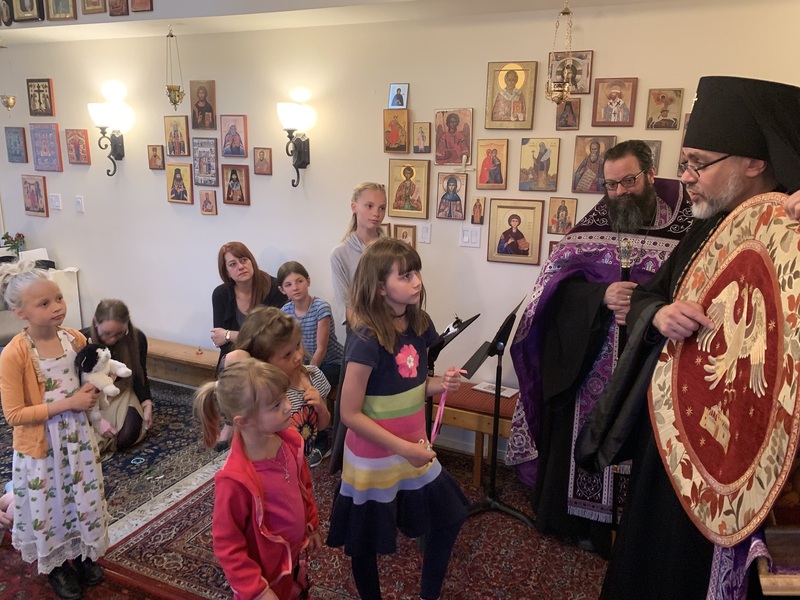 Entering the Sanctuary, Vladyka Daniel carried the Paten with the Holy relics. 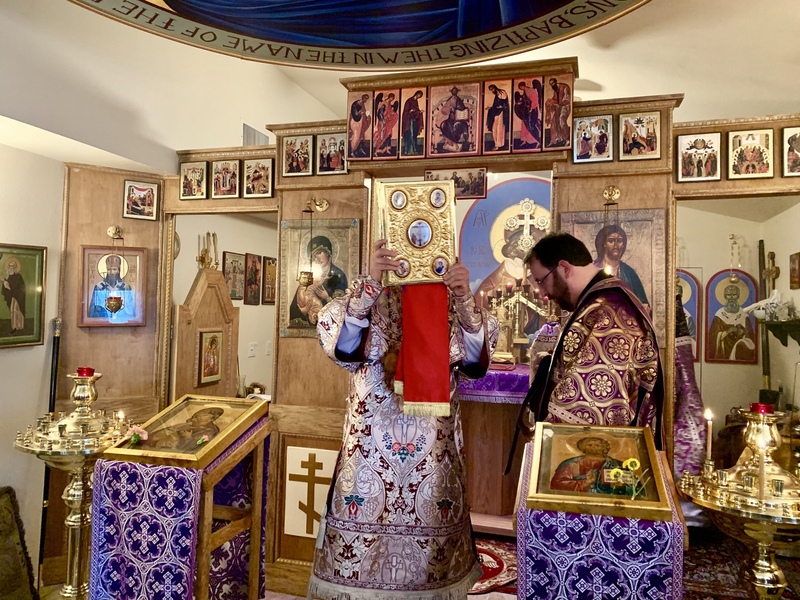 Uncovering the Paten, he placed the Holy Relics in a small silver box, bearing the seal of the Ecumenical Patriarchate. He poured Holy Chrism over the Relics, as this act symbolizes the union between our Lord, and His Saints. 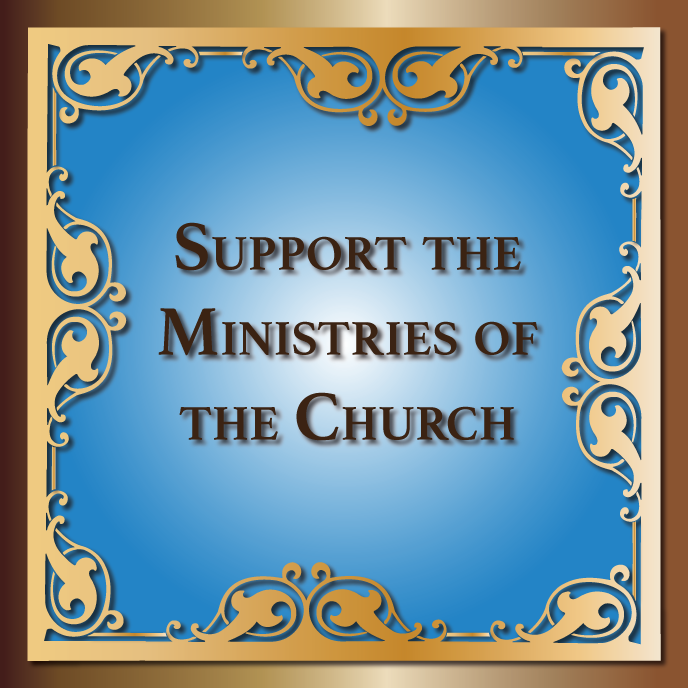 In the early years of Christianity, the Church was not allowed to exist; for many years, the early Christians were persecuted and killed for their faith in Christ. In those days, the Christians met in underground burial places and celebrated the Eucharist on the graves of the martyred Saints. 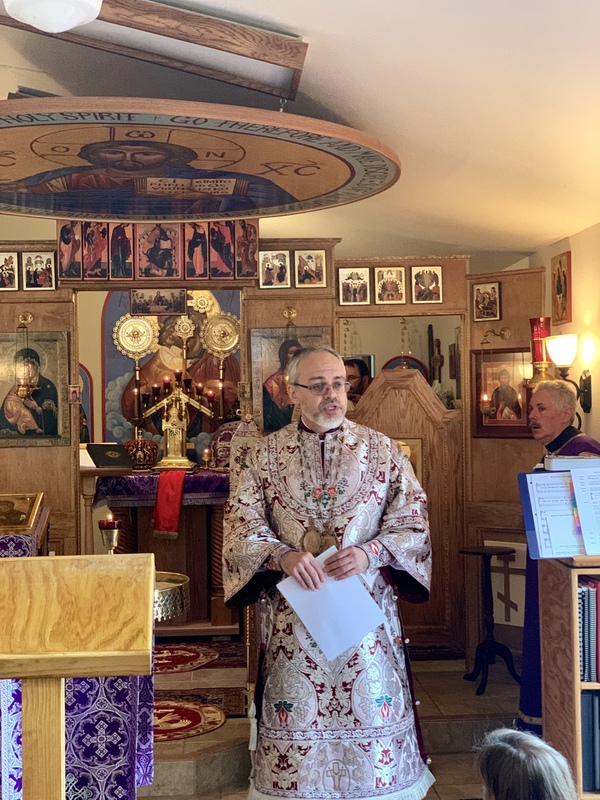 When the persecutions ended, and the Church was allowed to exist, the custom of celebrating the Eucharist over the graves of Martyrs continued by placing Holy Relics in the Altar at the time of the Consecration. 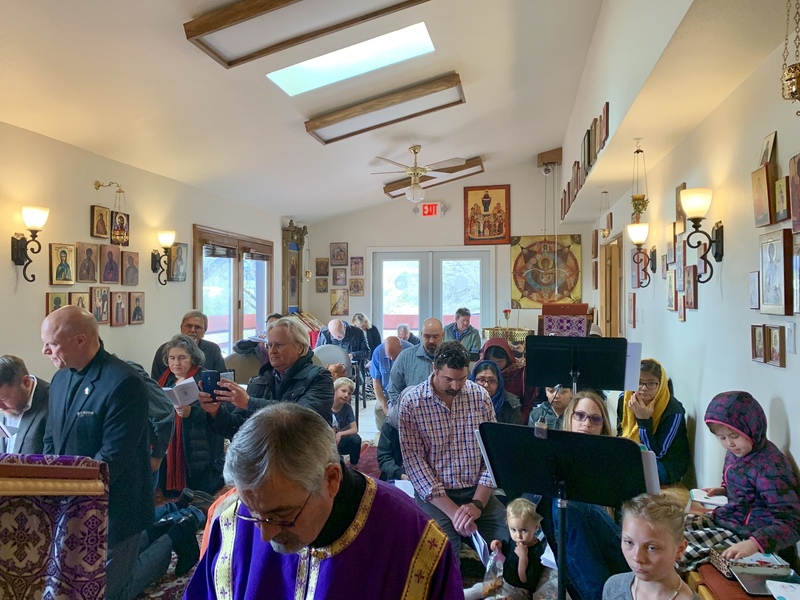 In this manner, we are always reminded that the Church was built on the Blood of the Martyrs and their faith in the Lord. 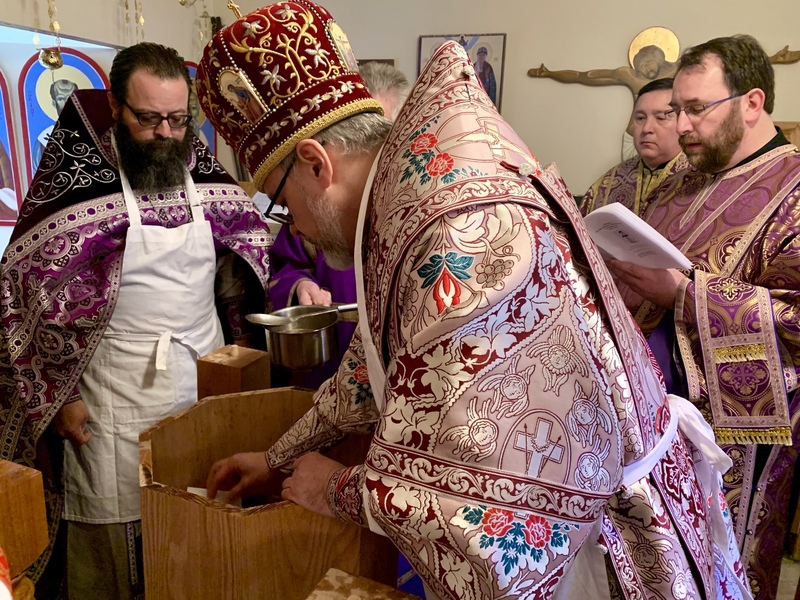 Since the Consecration centers around the Holy Altar Table (for it represents the center of all Sacraments and services of the Church), the Vladyka prayed and asked for God’s help to accomplish the service. 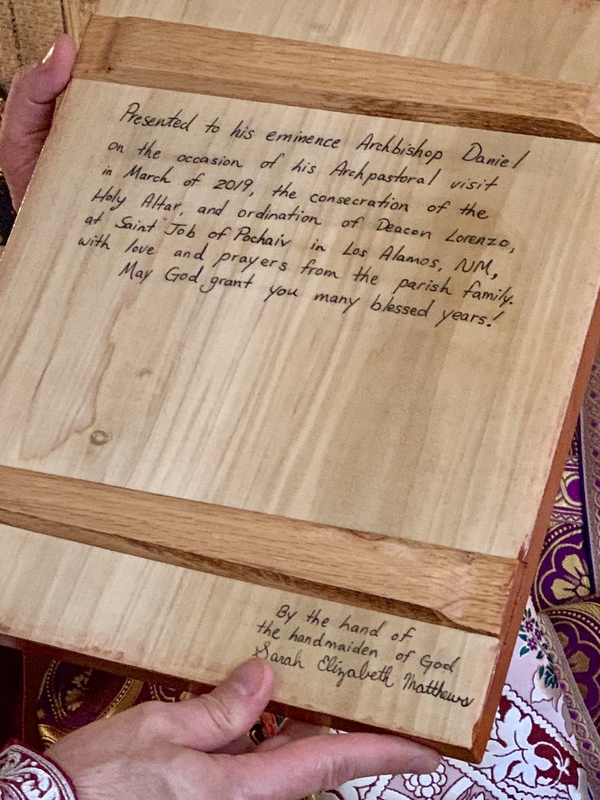 Following these two prayers Archbishop Daniel placed the silver box containing the Holy relics into a special cavity in the altar. In order to seal them permanently, he poured wax and mastic over them. 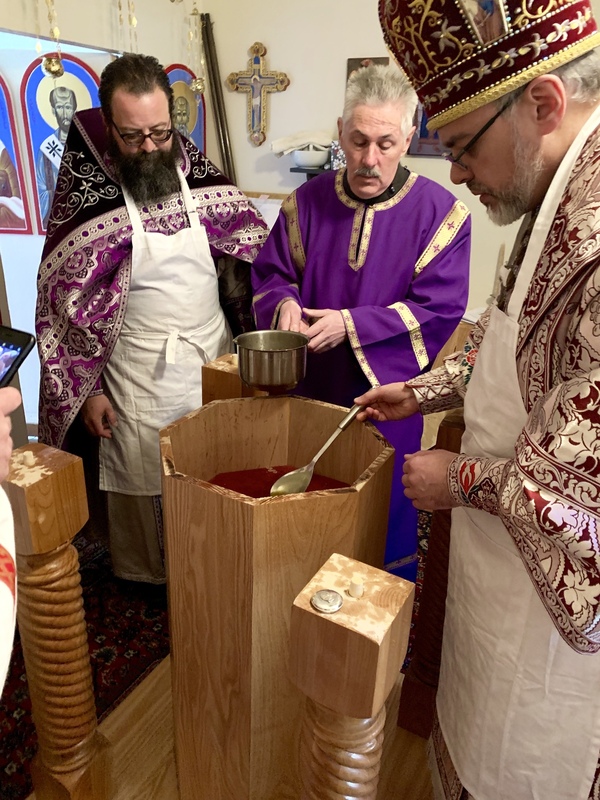 The wax/mastic contains many sweet smelling and fragrant spices, which were used by Joseph of Arimathea and Nicodemus to anoint the Body of Christ in preparation for burial. The Holy Altar represents the Tomb in which our Lord’s body was placed. 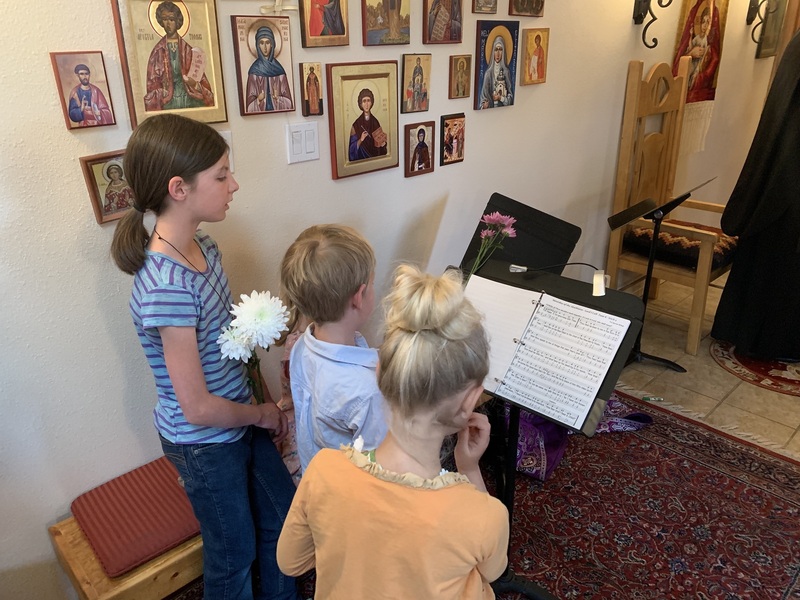 All of this took place as the choir chanted Psalm 145. Since the Altar Table represents the Tomb of Christ and His body lies therein. 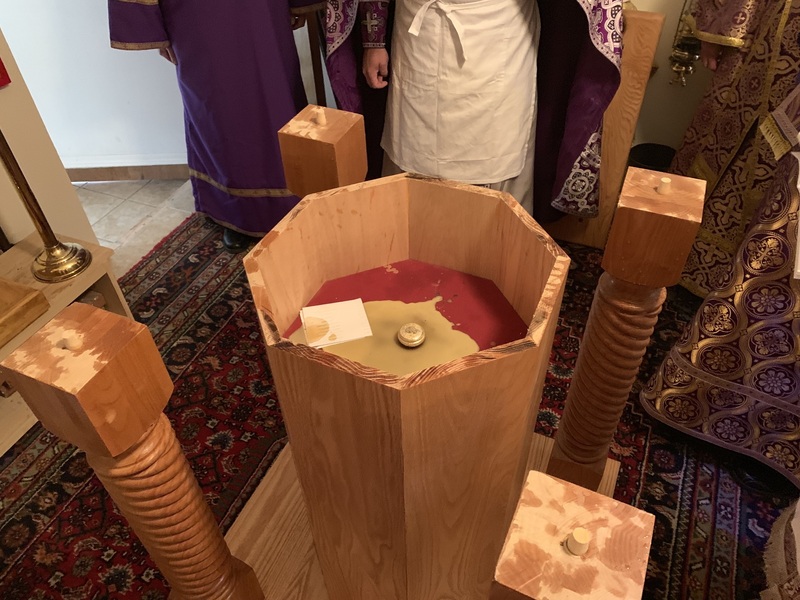 The Altar must undergo its own “Baptism” (washing) and “Chrismation” (anointing). Before washing and anointing the Altar Table, Vladyka Daniel put on a white linen garment called the Savanon. 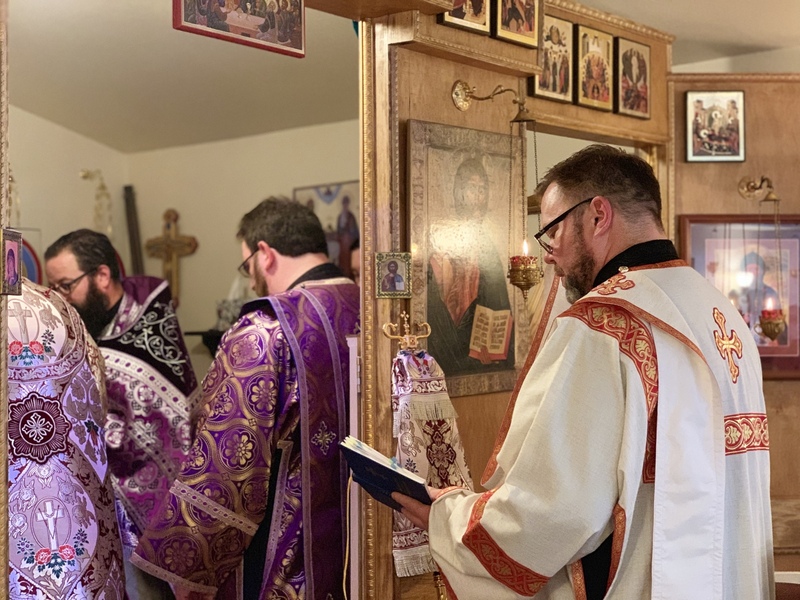 While the faithful knelt, the bishop read the prayer of Consecration. 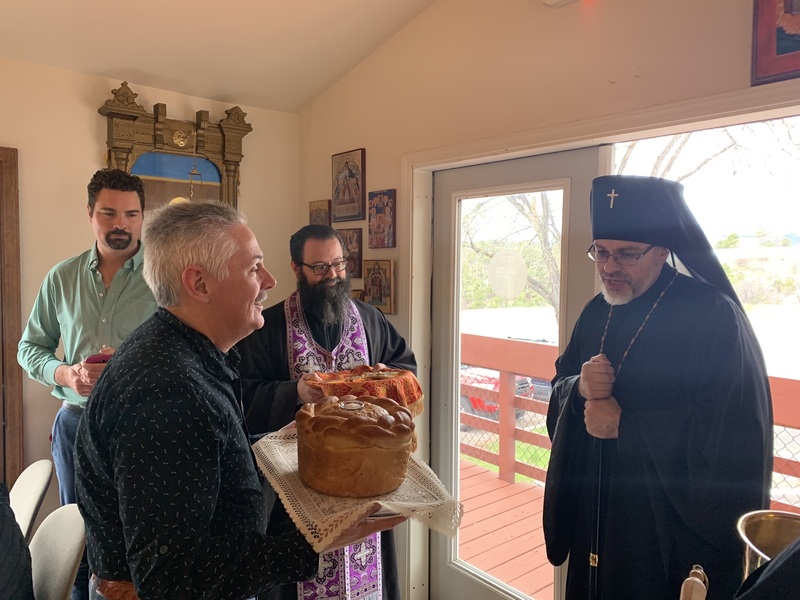 A basin of water was also brought to the archpastor who blessed and prayed for its sanctification. 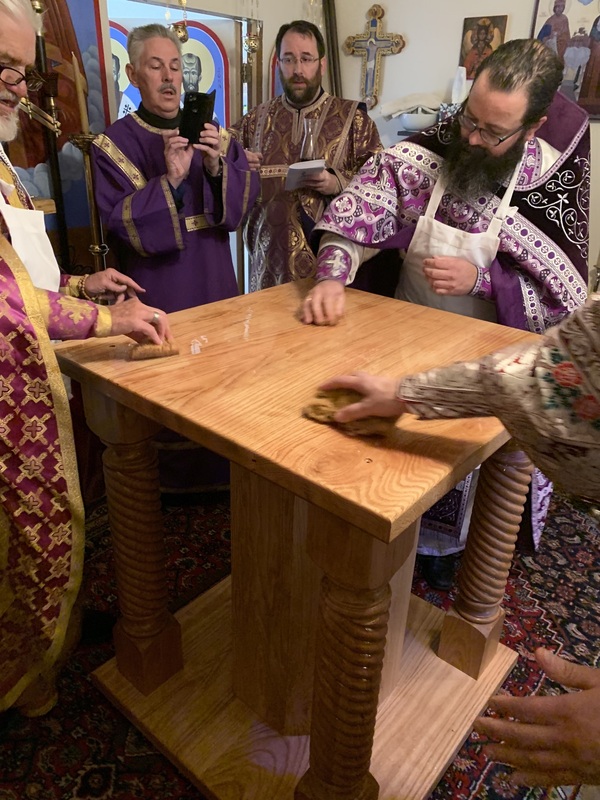 He then poured water on the Altar three times saying: “In the name of the Father, Son, and Holy Spirit”, and washed the Altar Table while Psalm 84 is read. 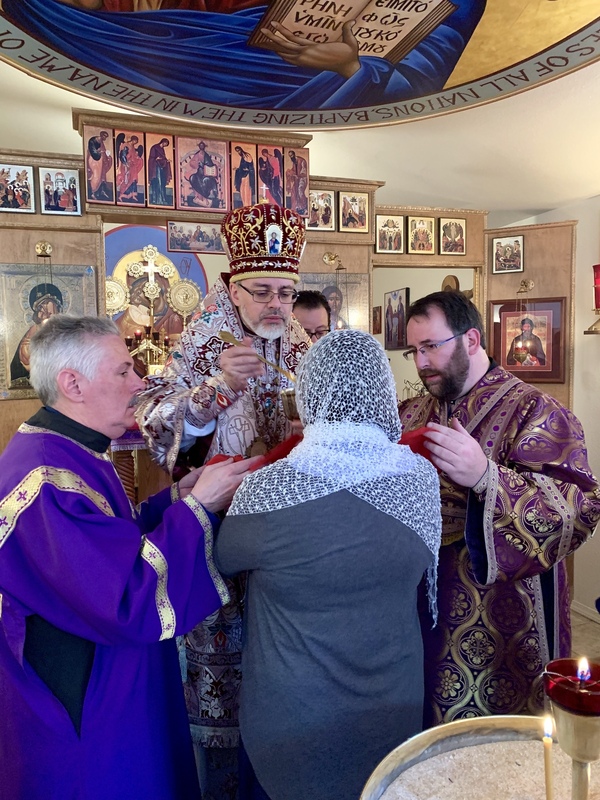 This act symbolizes Baptism: The Altar is cleaned by washing, and sanctified (made Holy) by the Grace of the Holy Spirit. 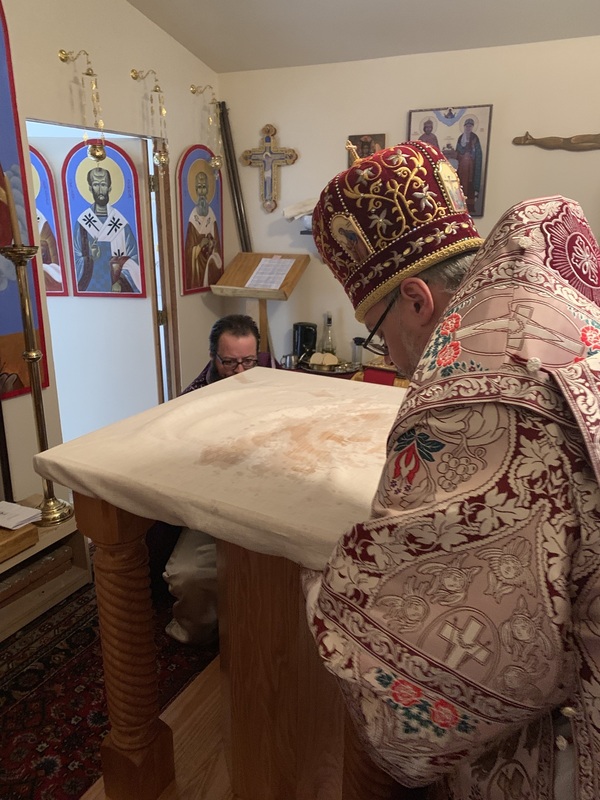 Vladyka sprinkled Rosewater on the Altar Table as he prayed. Rosewater is a sweet smelling fragrance, which was used to anoint the Body of Christ for burial. 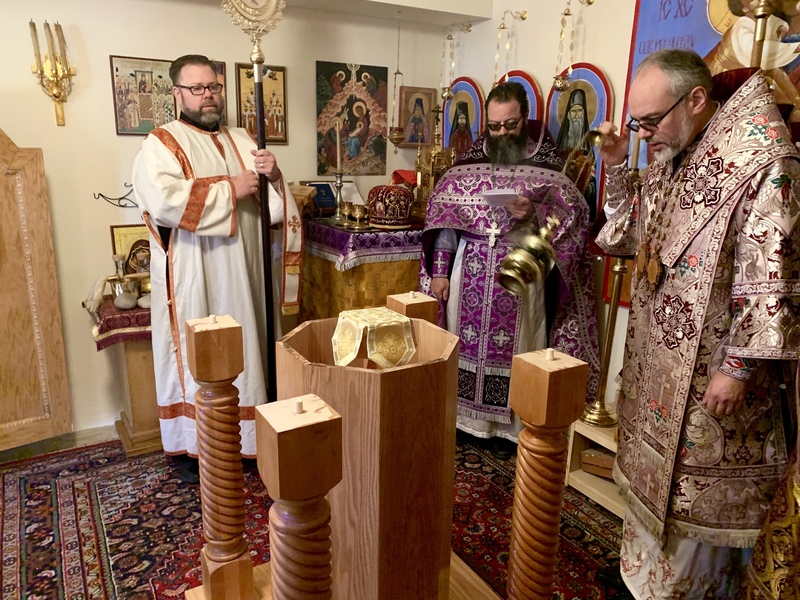 The Altar Table was covered with the “Katasarkion”. This white linen cloth represents the Lord’s burial shroud. The Katasarkion is tied with a cord which represents the cord with which our Lord’s hands were tied as He stood before the High Priests. 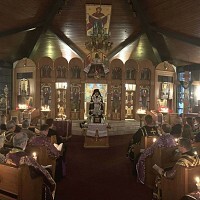 The Katasarkion will never be removed and will remain on the Altar for as long as the Church remains standing. 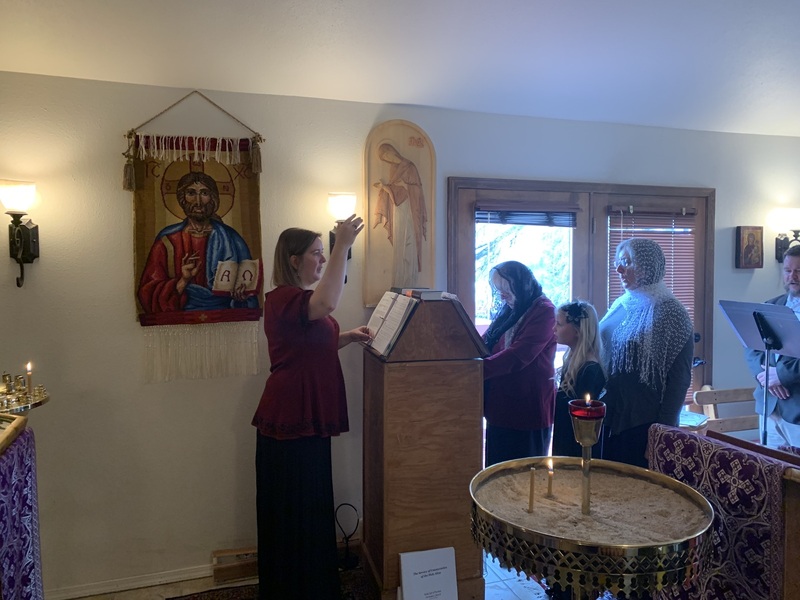 As the Katasarkion was being placed on the Altar, Psalm 132 was chanted. 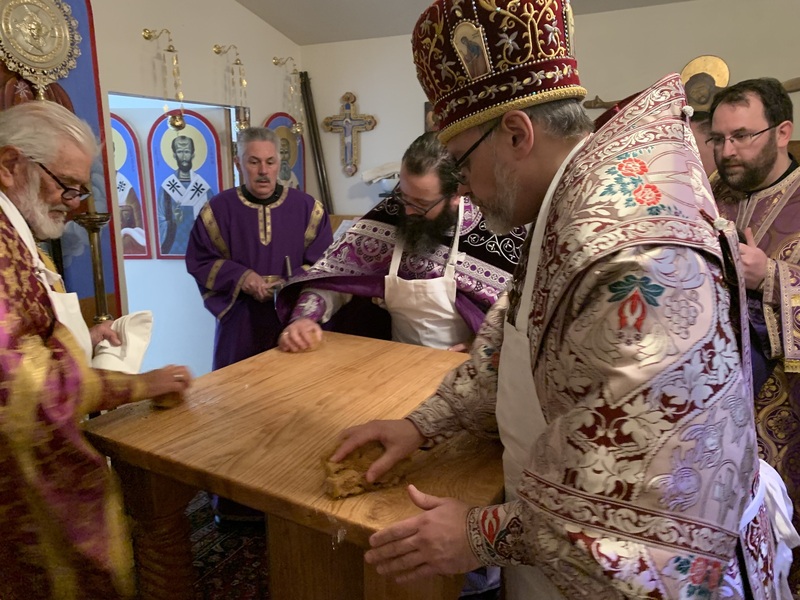 Having placed the Katasarkion over the Altar, the archbsihop said: “Glory to You our God unto Ages of ages.” He washed his hands, and covered the Altar Table with another cover which symbolizes the Glory of God. 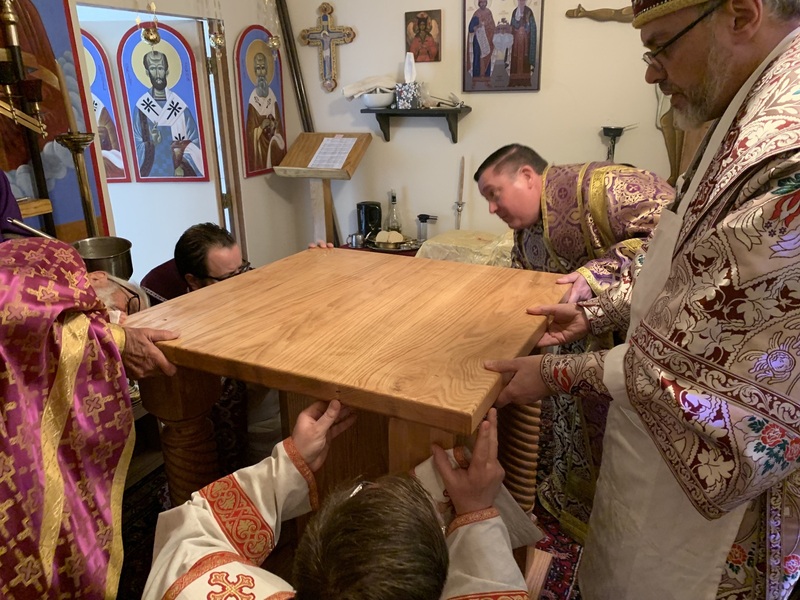 While he covered the Altar Table, the reader read Psalm 93. Following the vesting of the Altar, Archbishop Danielproceeded to place the other Holy Articles on the Altar Table. First he placed the Antimens; on top was placed the Gospel Book (representing the teachings of Christ.) The candlesticks, which were, placed last represent the Light of Christ that shines forth during the Sacred Services. 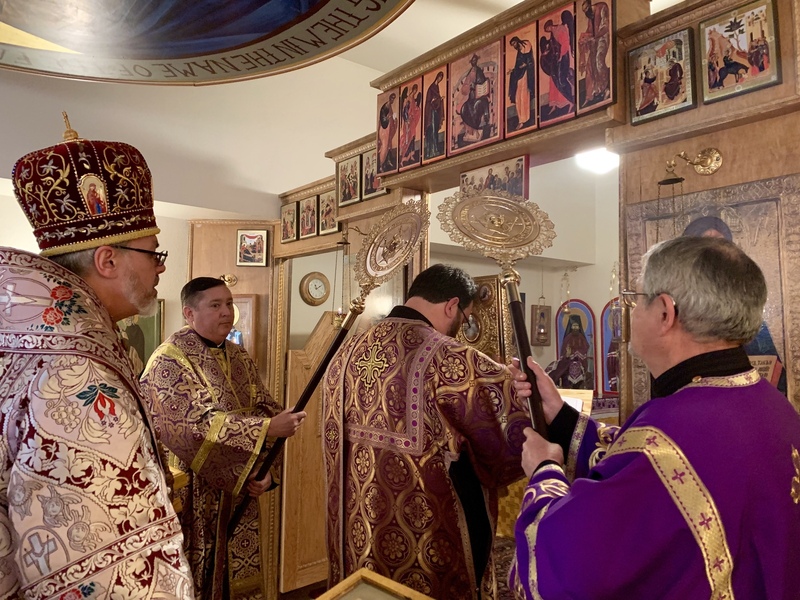 Since the Altar had been Consecrated, sanctified and adorned with all its furnishings, the Altar and the entire Church was censed by the archbishop with incense while Psalm 26 is read. 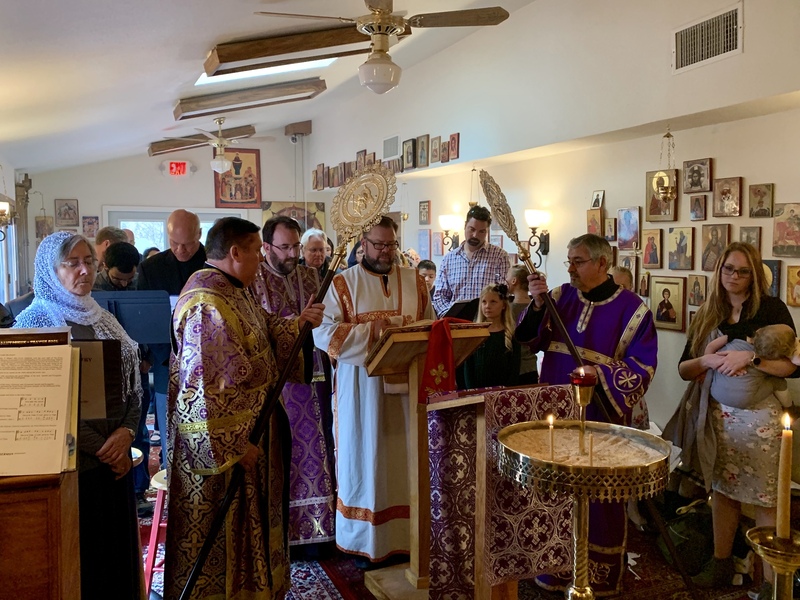 The first Divine Liturgy on the altar after its consecration was celebrated immediately after the rite of consecration. 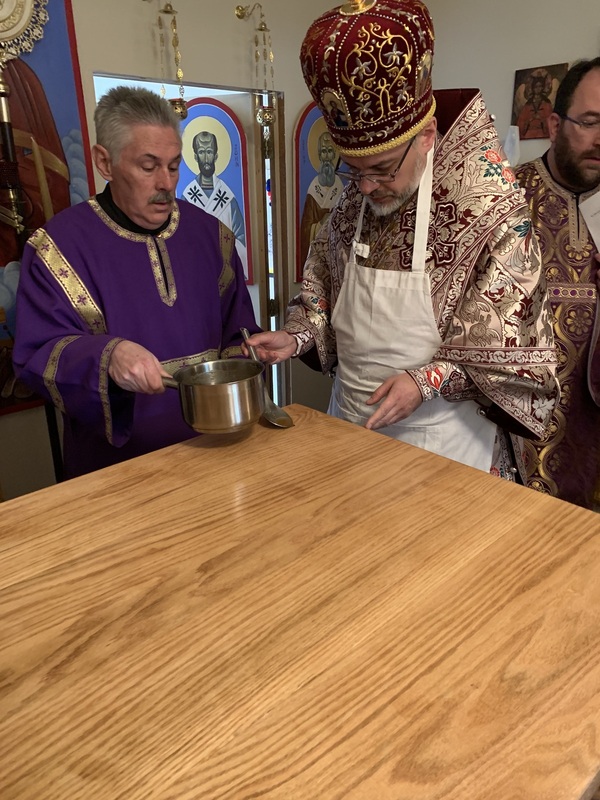 In his sermon, Archbishop Daniel reflected: “A few moments ago I anointed the altar behind me with the same oil you and I were anointed with at Baptism, the Oil of Chrism. 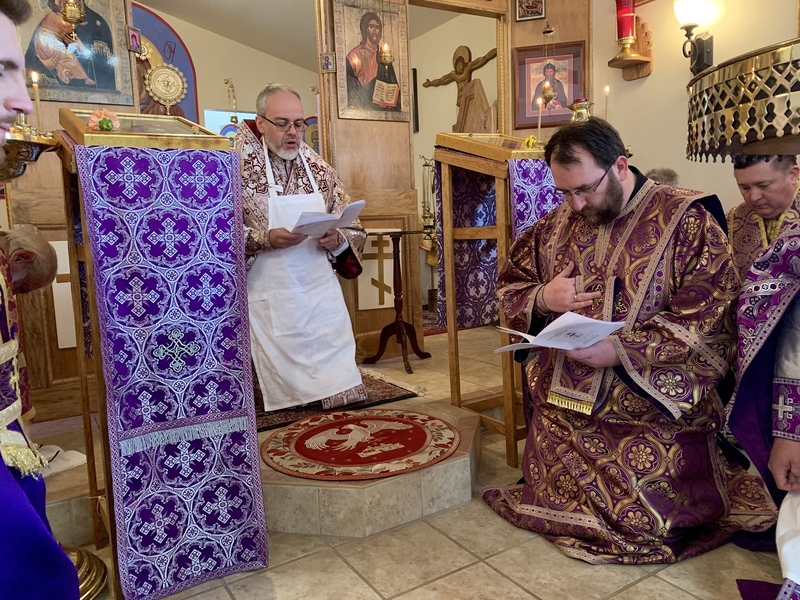 For us, Orthodox Christians - the altar is first and foremost for the sacrifice of Christ on the Cross, a sacrifice renewed at each Liturgy. 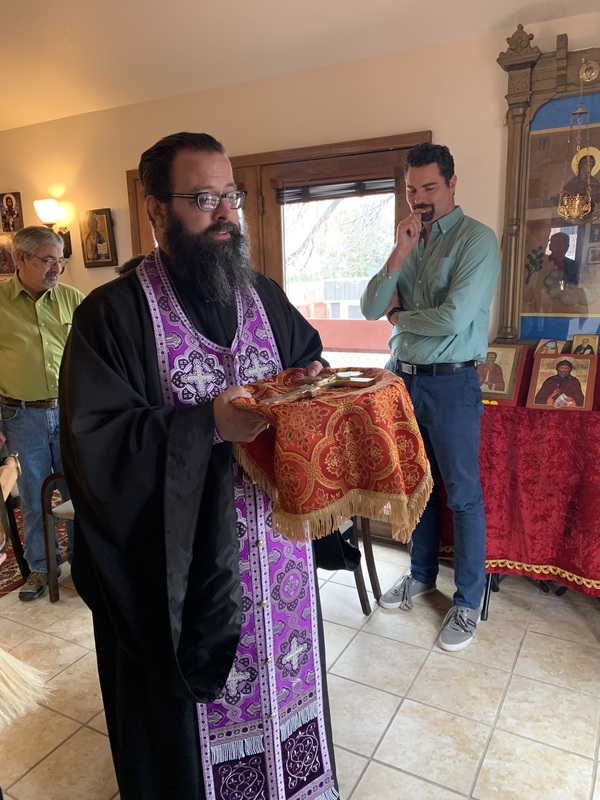 It is the sacred table at which the Holy Spirit makes present the sacrificial victim, the Son of God, Jesus Christ, and through the hands of the priest is offered to the Father to atone for our sins. 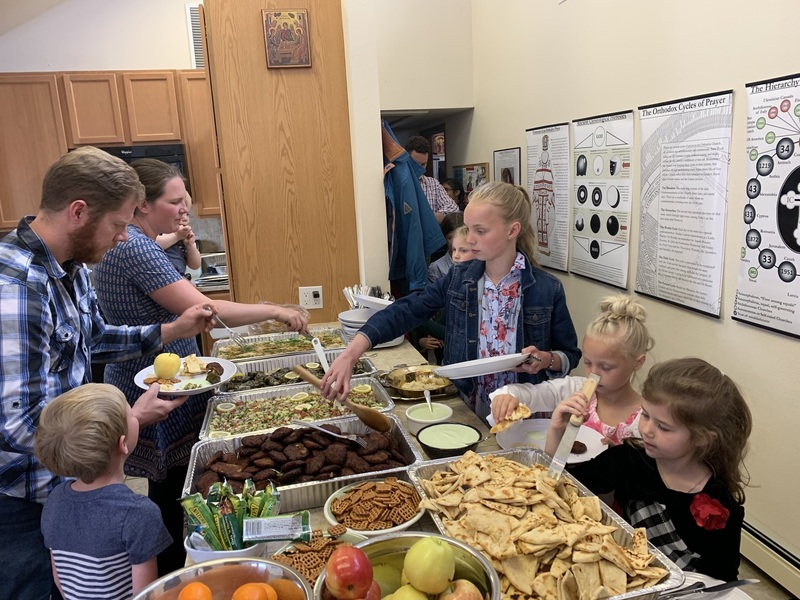 The altar is also a table where we, the sheep and lambs of Christ, are fed. 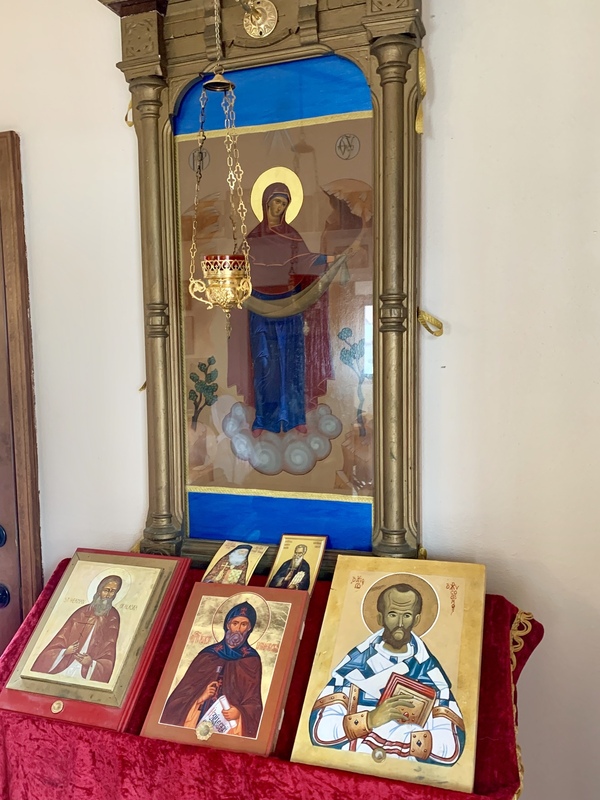 The altar is the center of everything in the Orthodox Church. 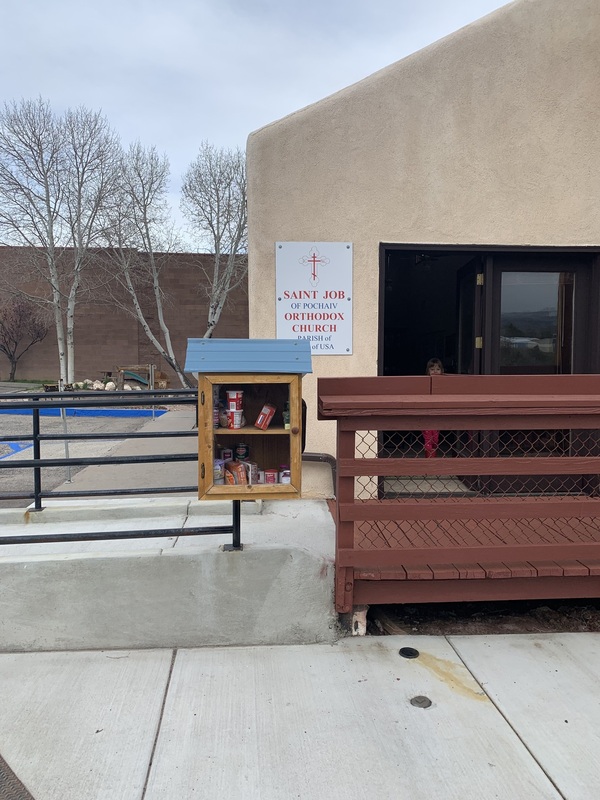 In fact, this altar is the epicenter of our Christian journey. 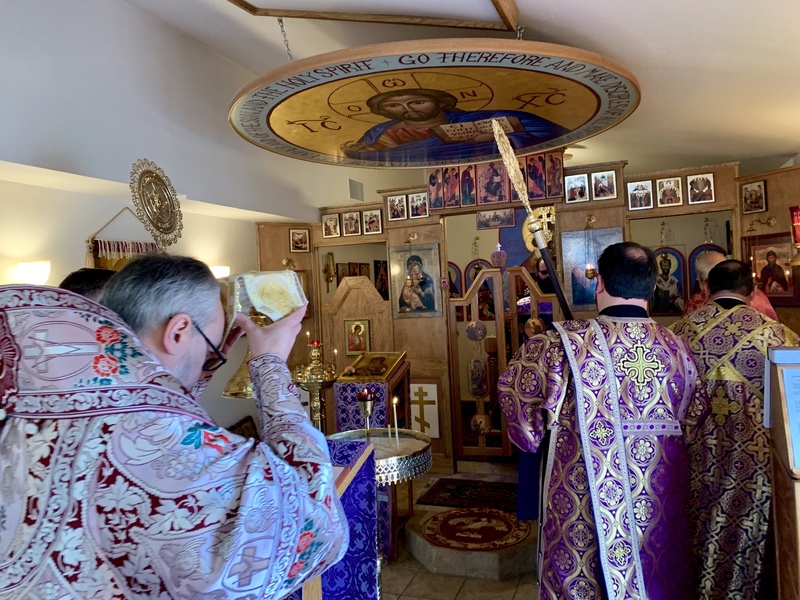 The worship in which we participate at this altar each Sunday is the most important activity in our personal lives and the life of our parish. 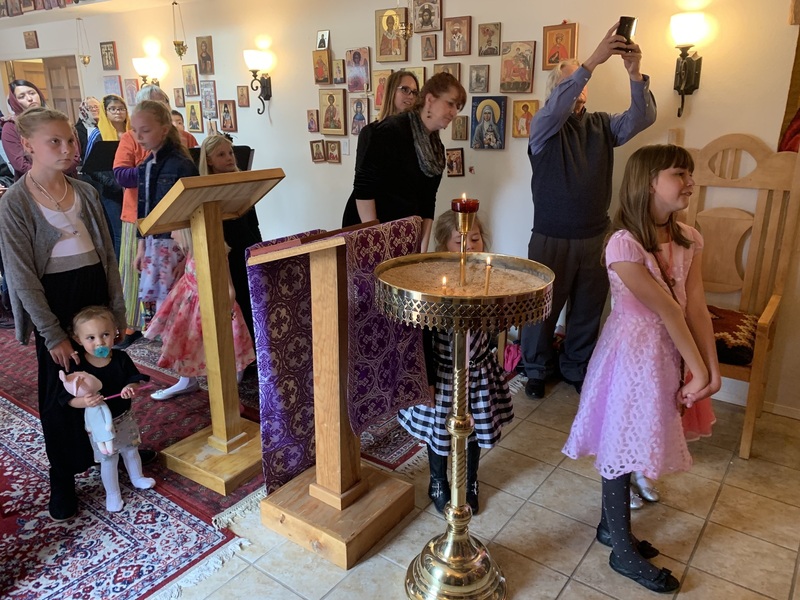 The offering of Christ made present at this altar sets us free to live as sons and daughters of God. 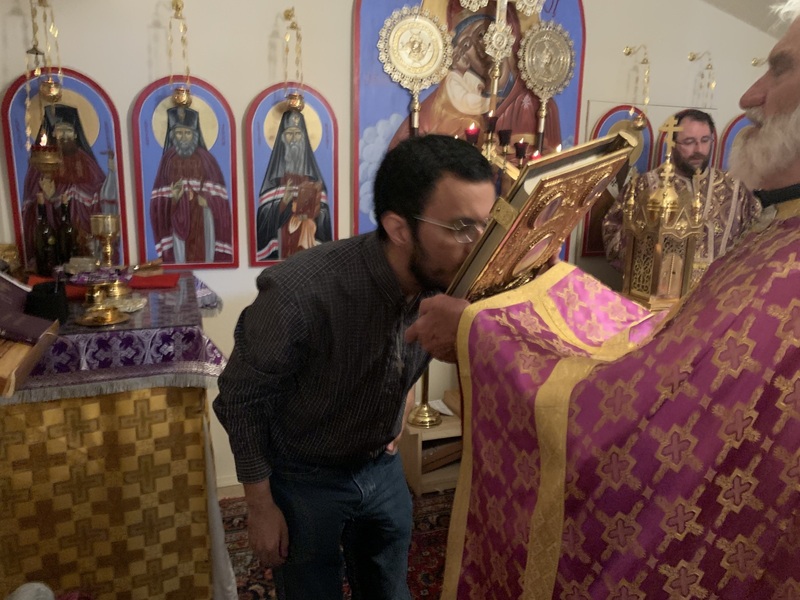 The anointing and consecrating of an altar has been part of our tradition going back to the time of Moses. 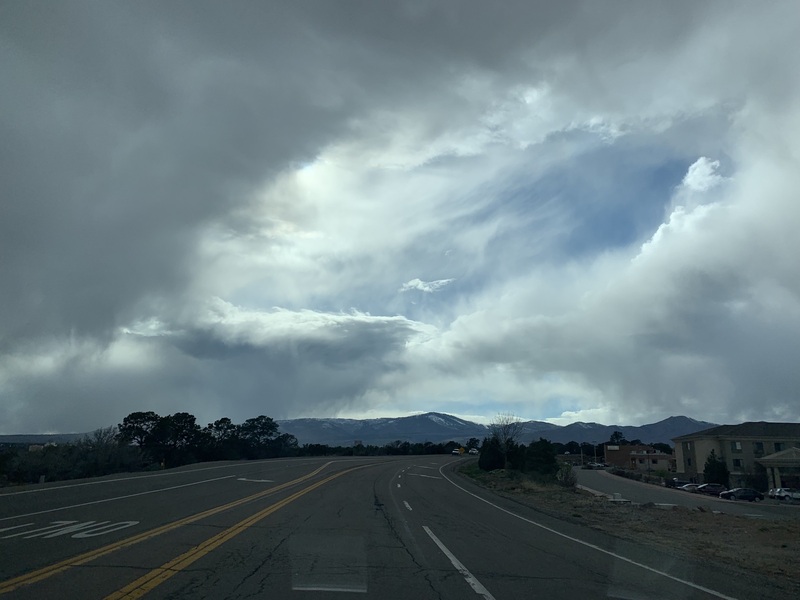 In fact, in the book of Leviticus 8 we hear, “Taking the anointing oil, Moses anointed and consecrated the Dwelling, with all that was in it. 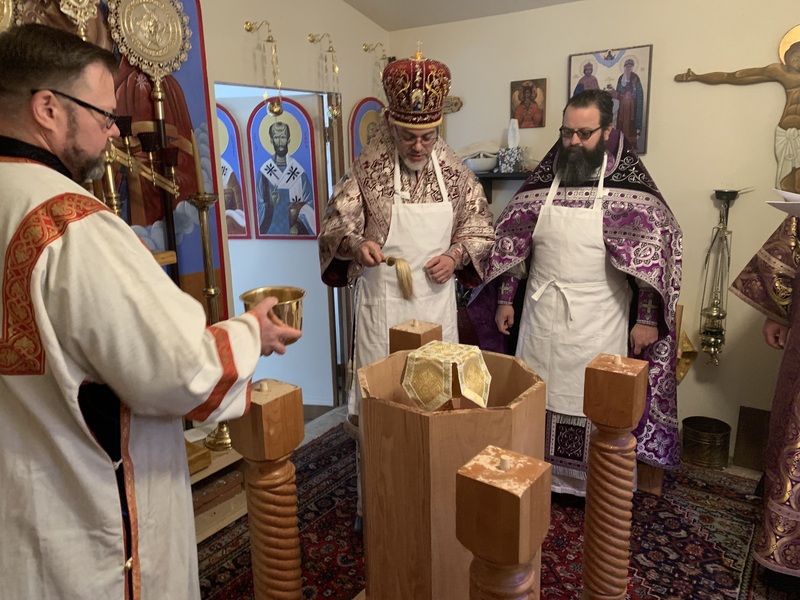 Then he sprinkled some of this oil seven times on the altar, and anointed the altar, with all its appurtenances, and the laver, with its bases, thus consecrating them." When I was in high school, I attempted to play several sports. Back then I was struck by way the competitions are measured – football and basketball have two halves; baseball is played in nine innings, and hockey and soccer have three periods. That sporting reasoning and rules bring me to the history of human existence. We measure history like football or basketball – in two halves: Before Christ and After Christ. However, I like to consider history more like soccer or hockey – in three periods. 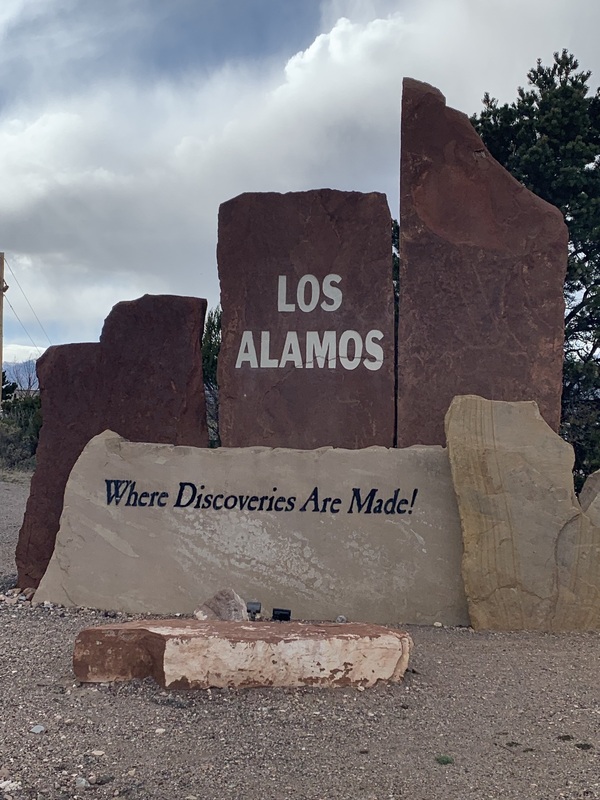 The first period encompassed God’s creation and the fall of the human race – the Garden of Eden and the sin of Adam and Eve – bringing about chaos, division and despair. 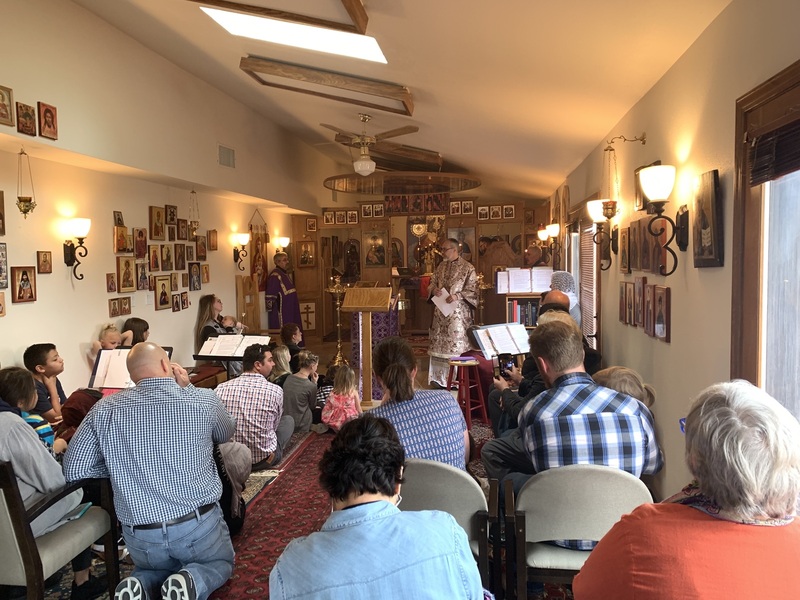 The second period began with the birth of Christ, who became human to address the chaos, the division and the despair, sharing the Good News of God with his friends and disciples. The second period was brought to an end when Christ ascended into heaven. 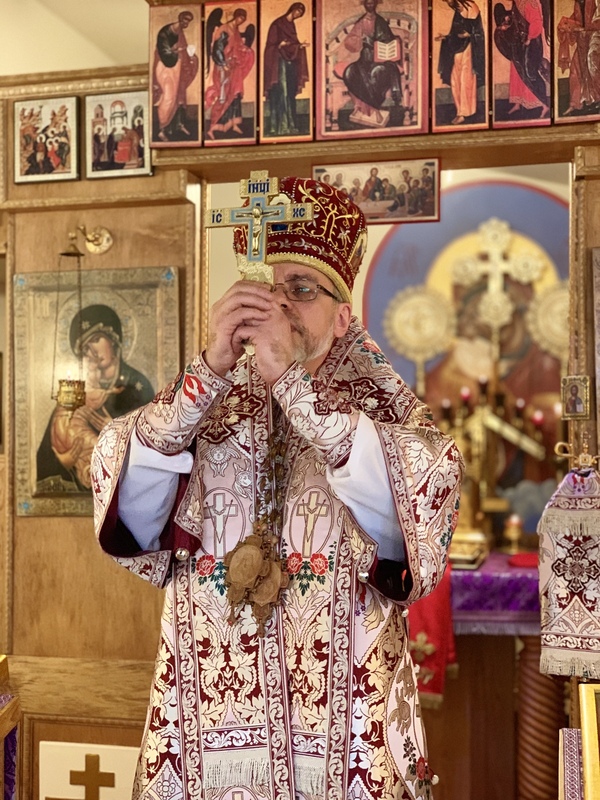 The third period, the Age of the Holy Spirit, began on the first Pentecost, and he has been at work ever since to bring all nations into the family of God. We get to live in this era of the Holy Spirit! Receiving power from God through the Holy Spirit, a spiritual power that transforms us. We have the power to call God our Father with confidence. That reaffirms and reinforces who we are as children of God. The power draws us to Christ, uniting us to him. The Holy Spirit is given to us to enable Christ to live in us. The same Grace of the Holy Spirit that comes today upon this sacred altar and enables us to LIVE His presence. The power of the Holy Spirit makes it easier for us to grow in holiness. 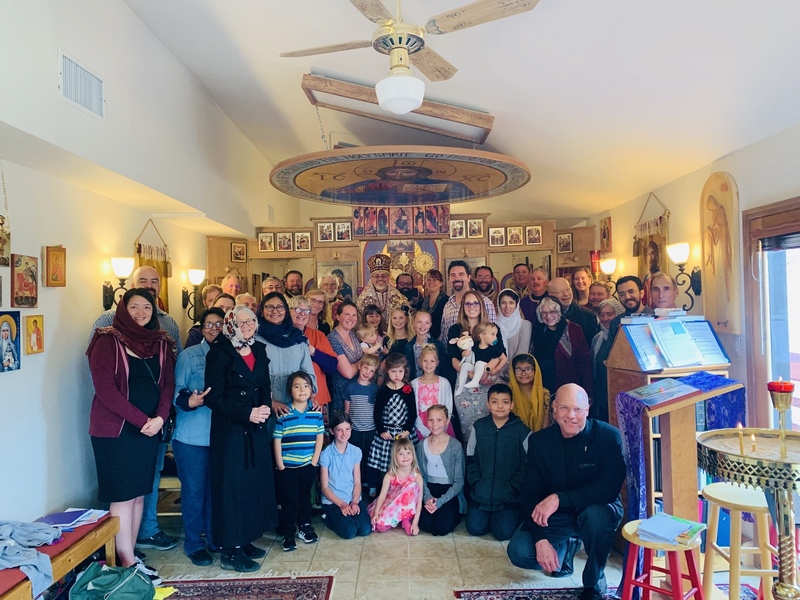 Dozens of people approached the Holy Chalice and received the Most Holy Eucharist from the hands of their spiritual father. 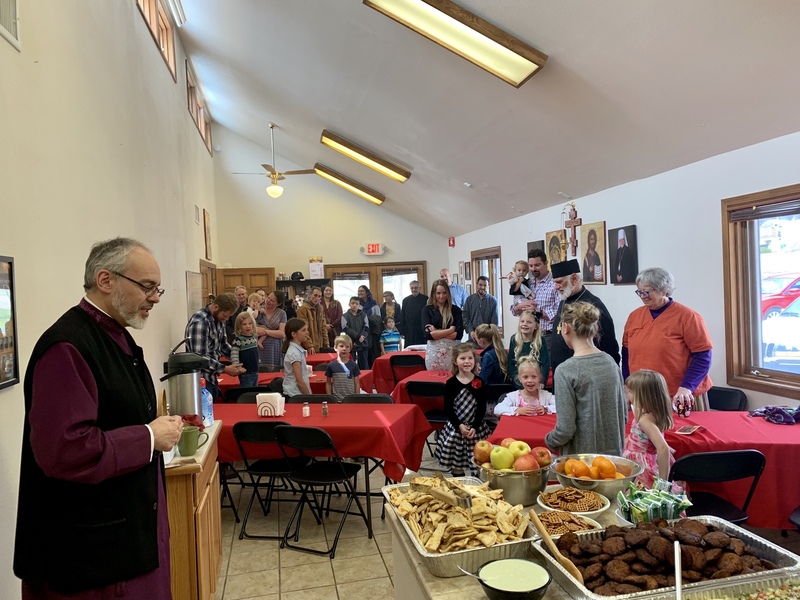 Following the conclusion of the Divine Liturgy, the pastor of the congregation – Fr. 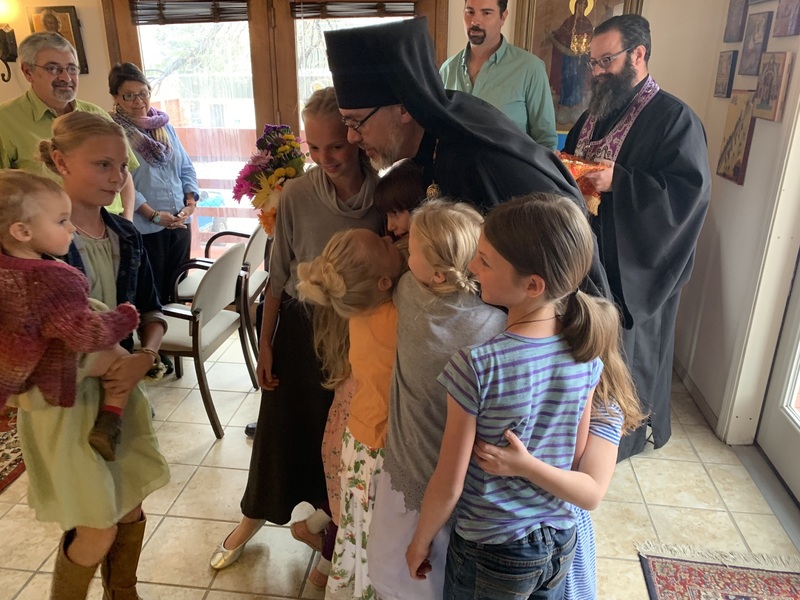 Theophan Mackey expressed his gratitude to the bishop for his spiritual care and love towards the flock of the Venerable Job of Pochaiv church. 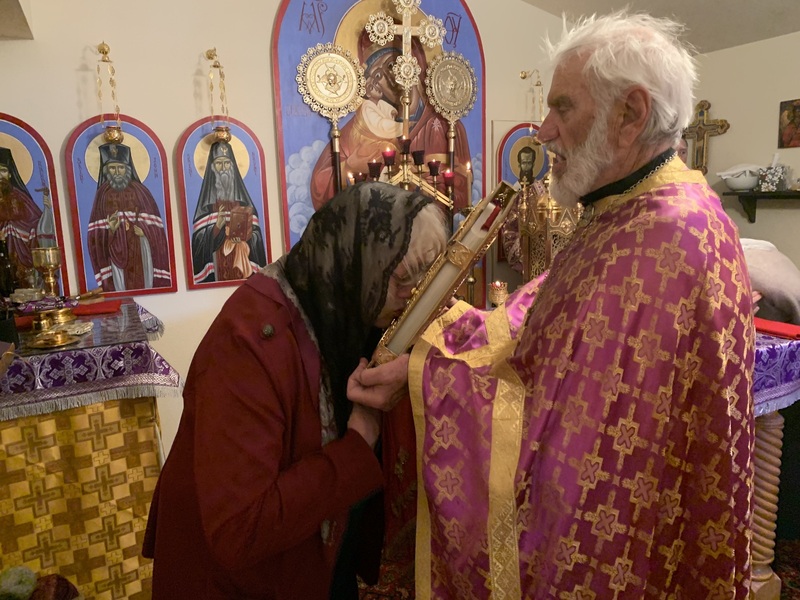 The entire parish congregation presented His Eminence with the hand-written icon of the Birth-Giver of God, as a spiritual gift that shall remind the hierarch of the consecration of the temple and the sacred Altar. 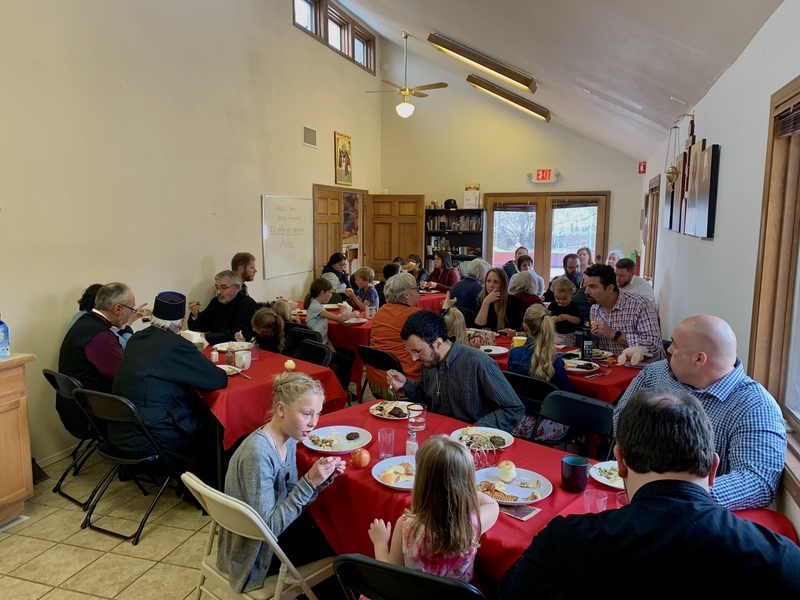 The prayerful day concluded with a Lenten luncheon, which gave strength for the faithful to come back in the evening hours of the day for the Vespers service, preparing the congregation for another day ahead – the Fifth Sunday of the Great and Holy Lent (April 14, 2019) – on which a spiritual child of the mission – Frank Lucero shall receive the Grace of the Holy Spirit to serve as a Deacon of the Holy Orthodox Church from the hands of Archbishop Daniel, the spiritual father of the Western Eparchy of the UOC of the USA.